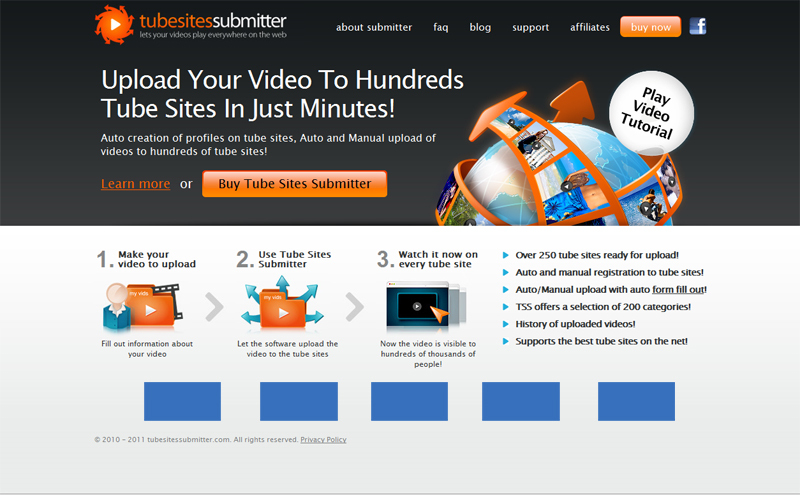 From today we offer you an exclusive advertising space on http://www.tubesitessubmitter.com/ site! Tube Sites Submitter attracts 100% of adult webmaster traffic. These are users who know how to make money using tube sites submitter. Promoting tube solutions such as: scripts, free hosted galleries, or anything regarding tubes. Large number of adult Webmaster resource sites, articles on adult webmasters resource sites, adult webmasters board, search engines, paid spots. Ads have the form of paid banners, 120 x 60 pix. Maximum allowed size of banner is 40 kB. How many people visit your sites? Our sites are visited by more than 3500 webmasters monthly, which are interested in Tube Sites Submitter! The campaign is displayed on all static Tube Sites Submitter pages. MAX 1:5! WE SELL ONLY 5 BANNERS SPACES MONTHLY! Over 280 tube sites ready for upload! Is this banner on the software console? Or just the website like other advertising with Chameleon?